One of the reasons I was thinking about this is because we cover a lot of different groups. People who are passionate about things they love. And those people are more diverse than the difference between our surf shirt and our zombie shirt (wait, maybe they’re not so different…) Why do we have so many different designs and why are we focusing on One Less Bully now? Then the answer came to me. I have friends who are into vampires. Friends who would never have anything but a Mac. Friends who only feel free when they’re on the slopes or on the water. Friends who read 50 times more books than me. As unique as we all are, as different as we all appear, we can appreciate each other for the very things that make us different. Those passions that make us read until 3 am or have us yelling at the top of our lungs because we’ re a Husky playing against the Cougars. And that’s why One Less Bully makes so much sense. One Less Nemesis celebrates the rivalries that exist between people who really love what they do. They’re passionate about what they love. And they are very individual people. Unique. At some point, we were all that awkward little kid, just trying to figure out what we liked and what we were good at. Bullies don’t like unique. Bullies make it harder for us to find where we belong. They bring us down and stand in our way. But if we stand together, we’re bigger than the bully. We’re strong enough to stop the bullying behaviors that make kids feel so lost and alone. We want those kids to find their way, find their passions and have the times of their lives doing it. 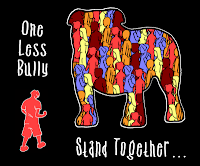 So as we get ready for a presentation to an elementary school on implementing a One Less Bully, Stand Together day at the school (and hopefully many schools), my head is clear. My vision is acute. I know exactly where we’re going and why we’re going there. And I feel so good about it.